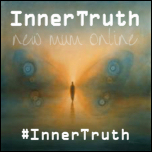 Apologies there was no Inner Truth post last week, but I kind of went off blogging in the last couple of weeks, for reasons that will become clear in a post that I will hopefully write tonight. I have done a lot of soul searching in the last few weeks and have had it confirmed that I do have post natal depression. Anyway, back to the Lemonade Diet (the Master Cleanse) - you have to do it for 10, 20 or 40 days, and I ended up doing 9 days. I learned a lot about myself during that time, and lost a lot of weight. I learned what the triggers are for me wanting to eat and it was revealing. Also, since I came off it I have been craving healthy food and now even ages later my portion sizes are smaller, as my stomach shrunk and I am NOT going to expand it back as our portion sizes in the West are far too large anyway. I will be doing the lemonade diet again some time in the not too distant future. So, I am moving forward in my Inner Truth journey and EVEN thinking about picking up yoga again. I taught for 6 years, up to being nearly 38 weeks pregnant and haven't struck a pose since Aaron was born. Struck a couple yesterday though, but need to do an actual kriya. Aaron's nursery is closing on Wednesday evening so I have Thursday off and the whole of the following week. It is my first time experiencing school holidays, as Aaron only started in September and nursery doesn't have half terms. I had hoped to go to Ireland but maybe I will just stay here and go inwards instead. The good thing about my Inner Truth journey is that I am getting to know my strengths as well as my weaknesses. I am actually starting to hear myself say "I am good at that" and "I could do that for you". I hope you will link up and let me know how you are doing. If you would like to grab the badge it is in a separate "tab" (page) on the blog. Sorry to hear about your PND, fingers crossed you can keep one step ahead of it.